The first day of one of the biggest racing events in North Yorkshire has been cancelled following bad weather. Organisers at York's racecourse said day one of the Ebor Festival had been abandoned due to a waterlogged track. 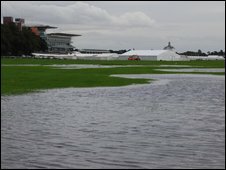 Heavy rain overnight on the Knavesmire left Tuesday's meeting untenable after an inspection at 0830 BST. Wednesday's fixture is also in doubt. Organisers said the course would be inspected to see whether the rest of the four-day festival could go ahead. James Brennan, marketing manager at the racecourse, said: "It is dreadfully disappointing for all the horses and their sections who have been looking forward to running and the thousands of race goers looking forward to coming to the city. "We remain positive about the back end of the week."